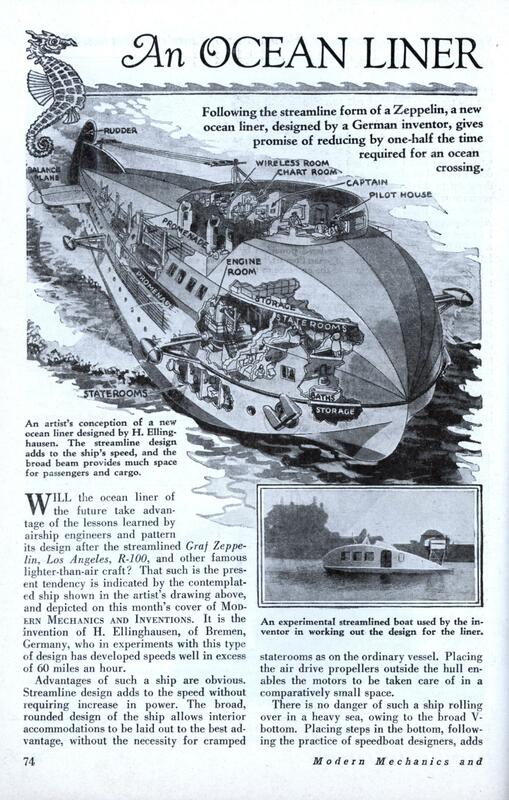 Following the streamline form of a Zeppelin, a new ocean liner, designed by a German inventor, gives promise of reducing by one-half the time required for an ocean crossing. WILL the ocean liner of the future take advantage of the lessons learned by airship engineers and pattern its design after the streamlined Graf Zeppelin, Los Angeles, R-100, and other famous lighter-than-air craft? 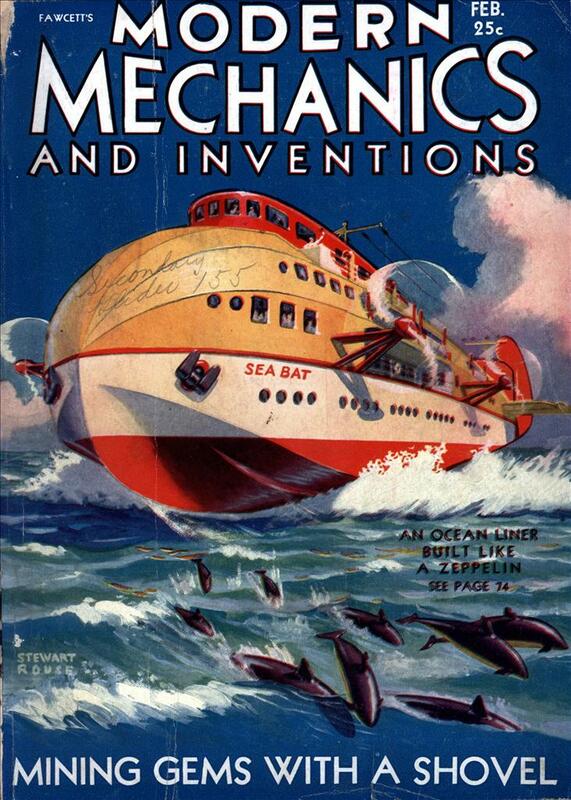 That such is the present tendency is indicated by the contemplated ship shown in the artist’s drawing above, and depicted on this month’s cover of Modern Mechanics and Inventions. It is the invention of H. Ellinghausen, of Bremen, Germany, who in experiments with this type of design has developed speeds well in excess of 60 miles an hour. Advantages of such a ship are obvious. Streamline design adds to the speed without requiring increase in power. The broad, rounded design of the ship allows interior accommodations to be laid out to the best advantage, without the necessity for cramped staterooms as on the ordinary vessel. Placing the air drive propellers outside the hull enables the motors to be taken care of in a comparatively small space. There is no danger of such a ship rolling over in a heavy sea, owing to the broad V-bottom. Placing steps in the bottom, following the practice of speedboat designers, adds to the speed of the craft. Promenade decks are built into the side of the ship so that the wind created by the boat’s own speed will not aNnoy the passengers. Tail controls similar to those on an airplane are used to keep the ship on its course, but an under-water rudder can also be added to get quicker response in emergencies. A special light metal which is the invention of Mr. Ellinghausen will be used when the ship gets under construction. He calls this metal ultralumin, and it differs from the more familiar duralumin in that it is an alloy of copper and manganese instead of magnesium and nickel. Ultralumin is corrosion proof—an important quality in a seagoing craft—and it also has easier working qualities. The record for an Atlantic crossing is now held by the German liner Bremen, It is notable that the Bremen is the first liner whose above-water parts have been consistently streamlined. Smokestacks, masts, and other exposed objects are streamlined to such good effect that it was almost inevitable she should capture the Atlantic speed record. Speed gained by streamlining is, as the saying goes, pure velvet. Adding more power to an existing design is an old way of increasing speed —at a considerable expense for fuel. Nice article, and there is actually a prototype. The main drawback I see compared to current cruise ships is the lack of windows, balconies, and spaces to be outside. from the motion picture “The Big Broadcast of 1938?*. It was a radio energy powered high speed transatlantic ocean liner. Maybe this article inspired the prop designer! *Forgotten except for Bob Hope’s “Thanks for the Memories”. Wouldn’t this be terribly inefficient because the propellers move air instead of water? Very inefficient. Airboats in the Everglades work because they’re small, light, and operate on extremely smooth water. This thing would churn up a lot of air without moving very fast because it would never be able to get up on plane. I see a few other little issues, like having four engine rooms rather than one, bathrooms at both ends of the ship rather than in the cabins, and the dependence upon the secret new lightweight metal claimed by the designer. A ship that treads air instead of water. This reminds me of the russian Ekranoplanes, ships that have wings and uses the lift generated to skip over the water at high speeds. Some of these russian ships can be quite huge. The largest is around 100 meters and weighs 540 tons.